The Ultimate Sony Zeiss Street and Travel Photography Kit: I’ve always wanted to own a Leica set up. I love the fact that it’s a hand-built, stealthy, compact photography solution. I’ve never been able to personally justify the cost of the body and legendary lenses. 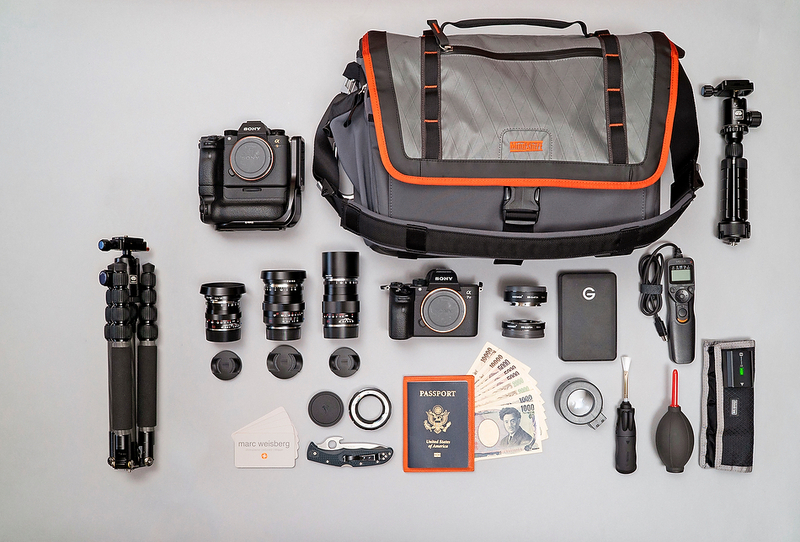 But hold the phone, because, for me, I’ve finally found the Holy Grail – Photography Travel Kit. At the heart of my travel kit are my Zeiss ZM lenses. The ZM’s are made by legendary lens maker Zeiss, who’s been producing some of the finest lenses on the planet for nearly 100 years. I never really understood what Leica photographers meant by lenses having character until I spent a month photographing with the ZM’s. The Zeiss ZM lenses are manual focusing lenses designed for Leica M mount camera bodies. I’m a Sony shooter and own at least a dozen Sony lenses ranging from the G series to their GM series. For me, the Sony glass is clinically as close to perfect as you can get. Sharp, no vignetting, pleasing color rendition, wonderful bokeh and well…..clinically right there. They are definitely my lens of choice when shooting for my clients. But the ZM’s are in another class altogether and they have lots of personality: The 1.4/35 vignettes when wide open. They all have a color signature and micro contrast reminiscent of shooting with Kodachrome film. Their bokeh is softer and different than any of my Sony glass. I’m getting more of a 3-D quality when shooting wide open than I do with my Sony lenses. They are bitingly sharp wide open and when stopped down. Much sharper than my Sony glass but in a different way. The Zeiss lenses are tiny, lightweight, superbly built and beautifully balanced on my a9 with battery grip and even more so on my a7III body with no grip at all. After a month with my Zeiss ZM’s I now understand what is meant by lens character and personality. The ZM’s are not made to be clinically perfect lenses. Rather they are made to exhibit Zeiss’s unique character which is quite different than what I’ve experienced having photographed with Canon lenses for 15 years and Sony for the last 3½ years. The best part is that I can throw three Zeiss lenses and one Sony lens in my MindShift shoulder bag, keep it lightweight, and travel the world without wishing I had more lenses to work with. Gear is identified left to right, top to bottom. MindShift Exposure 15: MindShift hit it out of the park with their Exposure 15 shoulder bag. I was excited to see the Exposure 15 online and after reading about its release I had to order one. The Exposure 15 checked all the boxes for me. I love to travel and have been caught more than once in a downpour in NYC and in Paris while doing an all-day photo walkabout. Threating skies and rain storms aren’t going to stop me from getting out to photograph and enjoy my travels. Both bags I’ve traveled with in the past have gotten soaked in the rain. Other selling points for me: The inside pocket depth is 10.4” which is substantially deeper than any other shoulder bag I’ve owned including Billingham and Peak Design. Lots of pockets including an under the front flap easy access multi-segmented pocket and a large zipper pocket for storing pens, business cards, keys and more. A side sinch-pocket for a water bottle. A back-side flap covered 15” pocket for maps and such. The Exposure 15 is massively padded for protection. Inside the bag is a padded pocket for my 15” MacBook Pro. What I’d Like To See: In future builds, I’d like to see a wider shoulder strap with more padding, a magnetic closure option on the front for on the go, run and gun photography. The current closure is a buckle snap that requires two hands to fasten the closure. A magnetic pull, locking closure would facilitate a quicker simpler method to secure the bag with one hand. I’d also like to see the back flap an inch or two longer to protect the back-pocket during inclement weather. Sony a9: My go-to 24.2mp, full frame camera, with 5-axis image stabilization, a speed [email protected] 20 frames per second with no EVF blackout. Pictured here with the Sony VG-C3EM Vertical Grip, and Really Right Stuff [RRS] L bracket. Sirui 3T-35K Table Top Tripod: Always innovating, Sirui developed this smartly engineered mini tabletop tripod which folds up onto its self. It’s small enough [folded: 9.5”, max height: 13.4”] and lite enough [15.2 oz.] to put in a shoulder bag and travel with. Also comes in super handy for desktop smartphone video, hiding speedlights around corners and to use in places that prohibit [full blown] tripods. Sirui T-025X Carbon Fiber Tripod with C-10S Ball Head: Sirui knocked it out of the park with this tripod. I believe it is the lightest weight, best priced, finest made, carbon fiber travel tripod on the market. It’s diminutive enough to stuff lengthwise across the MindShift Exposure 15 front flap and is superbly well made, weighing in at a insanely light 2lbs. This featherweight is sturdy enough to use for long exposure photography when traveling. I look forward to taking the T-025X on international travels. I own larger, more beefy tripods, but can’t imagine walking around with them all day. The T-025X…not an issue. Why Zeiss Lenses? : Keep in mind these Zeiss lenses are produced specifically for the Leica camera system. Scale Focusing or Zone focusing allows you, by means of the etched scale on the bezel of the lens, to choose an appropriate aperture to “dial in” your in-focus distance: For example, you could choose to everything in focus from 5ft. to 10 ft. or from 5ft to infinity, the choice is yours. Put two camera bodies in a shoulder bag with 3-5 lenses and you can travel the world photographing your heart out. Zeiss Distagon T* 1.4 / 35 ZM: My go-to landscape lens. Biting sharp at f/1.4 with lovely bokeh. Icy sharp when stopped down to f/5.6 – f/11. The Distagon lives on my a7III when traveling. Above: Landscape cropped for cinematic effect. Zeiss Planar T* 2.0 / 50 ZM: My go-to midrange lens and go-to portrait lens. When fully open to f/2.0 for portraits renders tack sharp with wonderful falloff, superb background bokeh and renders a three-dimensional look. Zeiss Tele-Tessar T* 4 / 85 ZM: Used in place of carrying a bulky telephoto like my amazing Sony 70-200 f/2.8 GM. Because it’s an f/4 it doesn’t have that close up bokeh of fast glass, but does have a pleasing and gentle out of focus character. It cuts sharp at f/4 and all the way through when stopped down. Believe it or not the 4/85 is smaller in girth and weight than the 1.4 / 35 ZM. Sony a7III: A full frame 24.2mp camera with dual SD cards slots, focus peaking for manual focusing, 5 axis stabilization, 10 frames per second, up to ISO 204800, silent shutter and so much more. But let’s get real. It’s good up to about 30k ISO. Just used this for four days straight with the above Zeiss ZM lenses and loved every second of it. The Sony VG-C3EM Vertical Grip, and Really Right Stuff [RRS] L bracket on my a9 is fully compatible with the a7III. Honestly, when using this camera with my Zeiss lenses, I don’t want for anything else. And I used the a7III without the grip. One battery lasted for four days of shooting. Fotodiox Pro Automatic Macro Extension Tube Kit for Sony E mount: One of my favorite lenses in my lineup is my Sony 90mm Macro f/2.8. Now I can feel comfortable leaving it at home when traveling. The Fotodiox 10mm and 16mm extension tubes are stupid inexpensive and seriously lightweight. It’s was a no-brainer purchase and I keep them in my bag for when I want to do some macro photography. You can use the extension tubes separately or stack them to get even closer than 1:1 macro photography. G-Tech Mobile 2tb Hard Drives: My mobile backup solution. I’ve been using G-Tech for years, both mobile and desktop drives. Switched over to their brand after using a very well-known brand for years that simply wasn’t keep up with the tech and also started failing on me. I’ve never had a G-Tech drive fail on me. Vello Shutter Boss: Use it both as a shutter trigger and an intervalometer. Moo Luxe Business Cards: Double thick and oh so dreamy. Voigtlander Close Focus Adapter: Adapts the Zeiss ZM lenses to my Sony E mount bodies. There’s a small red switch on the underside of the adapter that allows you to unlock and turn the bezel, which will halve the focusing distance. For instance, if the minimum focusing distance is 3ft. It will shorten the focusing distance to 1½ft. Helpful for creating more intimate portraits. Passport: Because I love to travel. Yen: Because I was supposed to go to Japan last year but had to cancel because a family member was gravely ill. Hoping I can go this year. Rocket Blower: Essential for on the move sensor dust removal. Think Tank Photo DSLR Battery Holder 4: Small. W well made, will last a lifetime. Great for organizing my Sony batteries for all my bodies. I own three of them. Not Pictured Here: Sony FE 12-24mm f/4 G: Sold my 16-35mm f/4 and purchased the excellent 12-24mm f/4 G. The 12-24mm exhibits minimal barrel distortion which is 100% correctable in Adobe Ligthroom. I pull out the 12-24mm when my 1.4/35 is not wide enough. The lens is always in my bag, fast to focus, is razor sharp with zero vignetting, sharp in the corners and sharp edge to edge. About the Author, Photographer and Educator: Marc Weisberg is an architectural and luxury real estate photographer based in Southern, California. Weisberg teaches a series of acclaimed Luxury Real Estate Workshops across the US. You can find out more about his workshops on his website. To see Marc’s Luxury Real Estate Photography Kit click here.